San Pedro Claver, the first person to be canonized in the New World, dedicated his life to tending to the enslaved from literally the instant they arrived in the Americas. A mouldering Colombian bull ring stands as a reminder of the country's complicated relationship with a brutal sport. In life, Claver became known as “Apostle of the Blacks” – or more derisively by his slavery-approving Jesuit brothers “Slave of the Slaves”– after arriving in Colombia from his birthplace in Verdú, Spain. Born to a prosperous Catholic family in 1581, the bright and pious Claver became a Jesuit at age 20 and promptly shipped off from his birthplace in Verdú, Spain, never to return to his homeland. 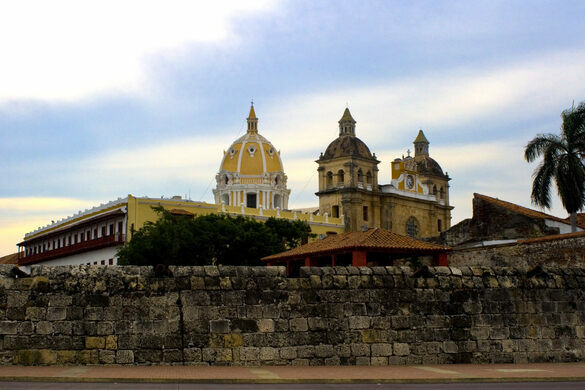 Upon arrival in Cartagena, Claver found it essential to his ministry to meet the slave ships as they pulled into port. For nearly 40 years, he would board the ships before they’d been emptied of their living contents, navigating cargo holds full of terrified slaves in order to be the first, lone face of kindness they would see in the New World. From there, he would follow their path to the holding pens, providing sustenance in tangible forms as well as spiritual. After his death in 1654 inside a small room within the Jesuit cloisters at the church that would later come to bear his name, word of his life spread around the world. A modest museum adjacent to the church dedicated to Claver has become a place of reflection and contemplation for all those who have been touched by the saint’s work, directly or otherwise. Under the church’s altar, the bodily remains of Claver rest in an illuminated case. Throughout the museum, religious works of art that date back centuries are displayed alongside Pre-Colombian archeological pieces. Many rooms and open air halls are lined with paintings and other creations either inspired by or featuring Claver himself. Visitors are permitted access to the rooms where he spent his final days, and firsthand accounts report an eerie feeling of being observed for the duration of one’s visit, though were this true, a more benevolent watcher seems hard to imagine. In front of the Plaza de La Aduana, next to the Modern Art Museum inside the Walled Town. Museum is located adjacent to the church.